LENOX Disney Beauty & The Beast Belle My Heart + My Hand is Yours Set of 2 NIB. Belle- My Heart is Yours. Beast- My Hand My Heart. 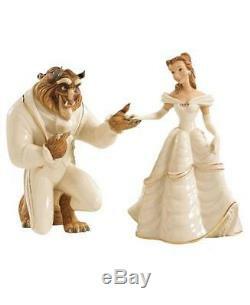 Belle- The Disney's Beauty & the Beast Figurine depicts this lovely film character in ivory china and 24 karat gold. Every detail of this superbly sculpted piece is just as it should be, from Belle's tender expression to her delicate shoulders to the cut of her gown. Beast- Disney's My Hand, My Heart Figurine portrays the unforgettable suitor of Disney's "Beauty and the Beast", on bended knee, his hand outstretched to his true love, Belle. Crafted of hand-painted Lenox ivory fine china accented with 24 karat gold. Under license by Disney, which has reviewed this product for quality and authenticity. Height: Belle-8", Beast- 7.25". Pet and smoke free home. The item "LENOX Disney Beauty and The Beast Belle My Heart My Hand is Yours Set of 2 NIB" is in sale since Saturday, March 24, 2018. This item is in the category "Collectibles\Decorative Collectibles\Decorative Collectible Brands\Lenox\Figurines". The seller is "des569" and is located in Southwestern PA. This item can be shipped to United States.